The Centre for Studies in Higher Education (CSHE) at the University of Kent had organised a research festival with a series of quick-fire lightening talks. For my 5 minute presentation I decided to focus on specific elements of the my PhD research into the construction of academic identity under the influence of fibromyalgia. The presentation was entitled “Creative methods to explore academic identity“. 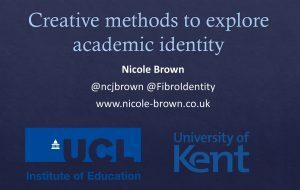 I briefly introduced fibromyalgia and the approach I have decided to take for my research into academic identity. I introduced the concepts of identity boxes, representations and simulations and provided some examples of raw data that I am working with. I then highlighted the difficulties of using these creative methods for researching academics’s experiences.